One of the things that you got to do after coming to the US or Canada is to see one of the Wonders of the World - the Niagara Falls. I had heard a lot about these falls and also seen them in one of the friends e-album. Niagara falls have an American side and a Canadian side to it. The American side of these falls is located in Buffalo, NY. It was a long but beautiful drive from Massacheussets to New York, a journey of nearly 8 hours. After unloading our luggage at the Rodeway Inn in Buffalo, Sanjay, I, Deepak and Jayesh decided to go to the Falls first so that we could get the hang of the route from our hotel to the Falls. It was an eventful ride and at one point we almost headed towards the Canadian border. To venture into the Canadian side, you need a Canadian Visa or you have to be a US resident. Since we did not have the Visa, we could have landed in trouble had we just crossed a road signal and headed towards Canada. Baal baal bach gaye!!! 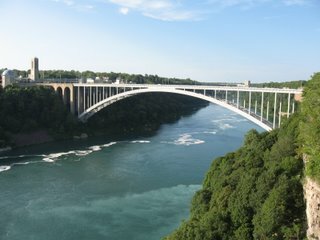 Well there are 3 major attractions at Niagara - the Maid of the Mist, Cave of the Winds & the Rainbow bridge. 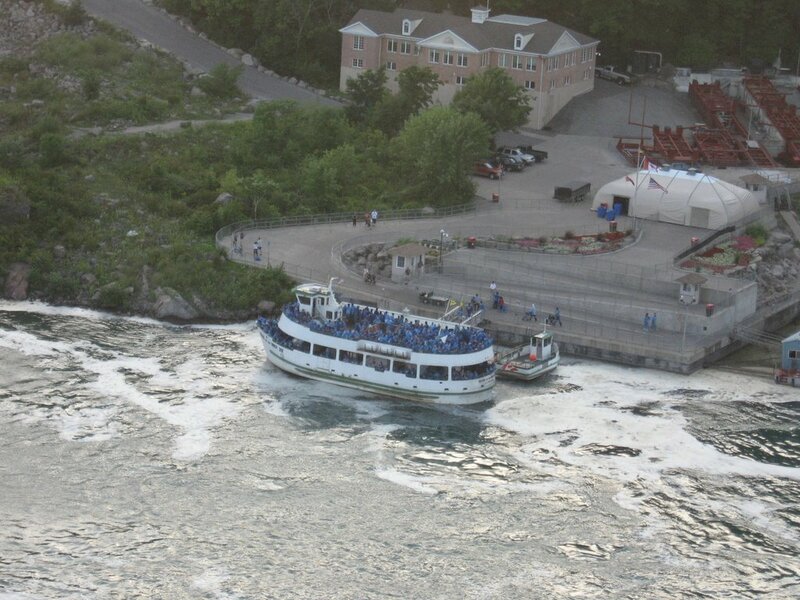 The Maid of the Mist is a small cruise that ventures into the waters of Niagara taking you as close as possible to the Falls. 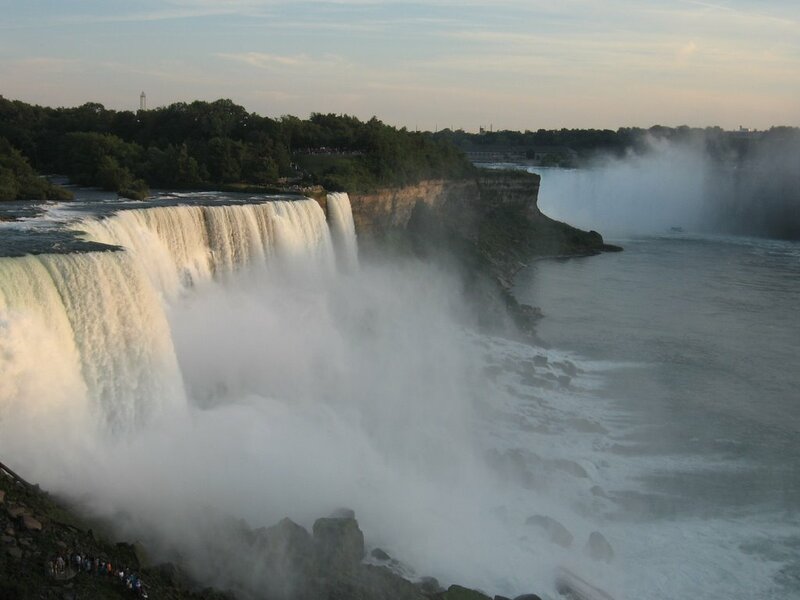 As mentioned earlier, there are 2 falls at Niagara - the American falls and the Canadian falls also known as the Horseshoe falls. Its a thrill to ride the Maid of the Mist and see the force of Mother Nature. We then walked to the Cave of Winds. 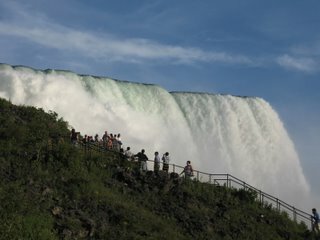 I seriously need to appreciate the Americans for making it possible to almost walk under the falls without 1% of a risk. It was a breath taking view of the American falls from the Cave of the Winds. American Falls ke ekdam opposite yani Canada ki side se coloured lights flash kiye jaa rahe the. Neele, laal, hare, safed...in rango ne jaise ek alag hi jaan daal di thi us tej bahte paani main. Rango ki vividhata ne saara mahol hi badal diya tha. I had decided not to wear a raincoat while going to the Cave of the winds and I enjoyed every second while I got soaking wet in mere seconds. The Rainbow bridge connects US to Canada. A symbol of friendship bewteen the 2 countries, once anybody could just walk on the bridge and walk from one side to the other. But due to the security threats after 9/11, things have become strict. Its a very beautiful bridge standing tall over the Niagara river. After capturing the ever-flowing waters of Niagara in my camcorder and with a feeling of satisfaction & euphoria, we headed back to the hotel.